Developed at home in my kitchen for bbq competition’s, this Sweet Heat bbq sauce goes great on everything! A sweet apple flavor is followed up with spicy chipotle pepper heat. 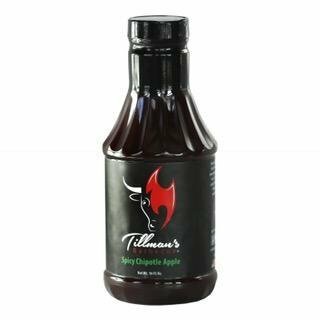 I have won several awards at bbq competition’s using Tillman’s Spicy Chipotle Apple mixed with Tillman’s Competition Brew. We use Spicy Chipotle Apple on everything from Taco’s to hotdogs and hamburgers!